On my way home today, I stopped by our neighborhood gas station to fill up the tank. 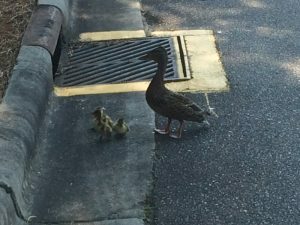 As I was leaving, I noticed a mother duck and four ducklings walking along the curb of the shopping center driveway. They were making a lot of noise. The mother was cluck-cluck-clicking, and the ducklings were cheep-cheep-cheeping. They were standing pretty close to a storm drain. 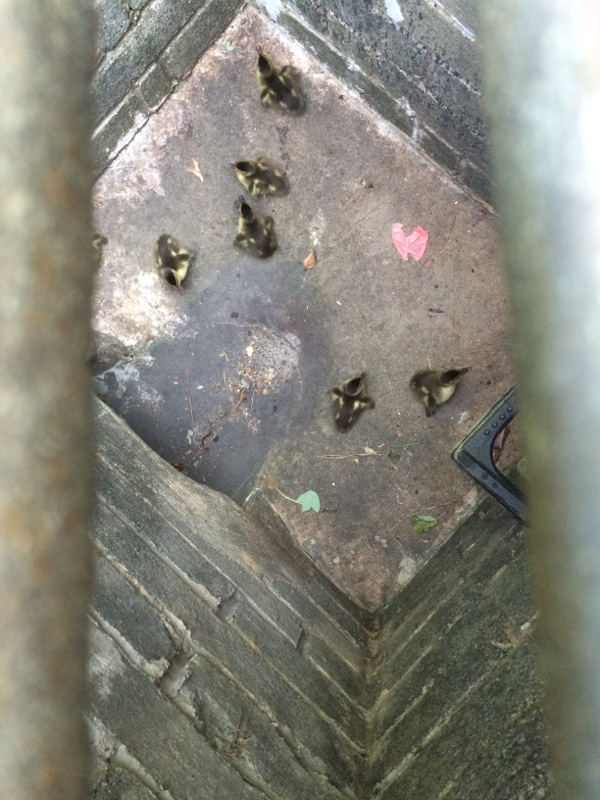 Then a car came whizzing by and one of the ducklings jumped into the storm drain! 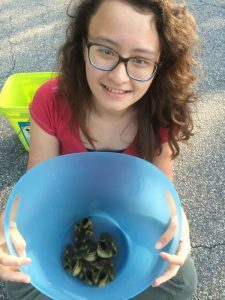 I went over to the storm drain and found six ducklings at the bottom! So I rushed home and recruited Audrey and Sydney, who were eager to help. We got some buckets and brooms and some rope and went back to the shopping center. By that time, a couple of other people were gathered around, and they said they had called the Cary Police. We went ahead and lifted the storm drain grate and one lady climbed in, carrying a bucket. One by one, she lured them close and plucked them up and into the bucket! 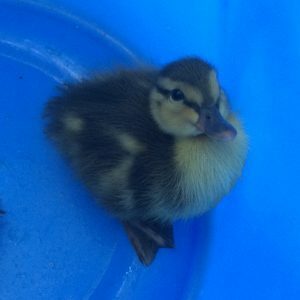 The Policeman finally showed up, and we went looking for the mother duck and the other three ducklings. They could’ve been in the woods or near one of the storm drains. We finally spotted them in the pond across the street. So we carried our bucket to the pond. When we got close, the mother heard the ducklings cheeping and she ran over to us. Sydney laid the bucket down sideways in the grass and we all backed away. 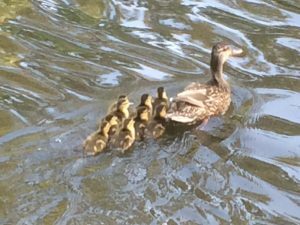 The mother duck ran to us, quacking like crazy, and all of the ducklings started cheeping even louder. 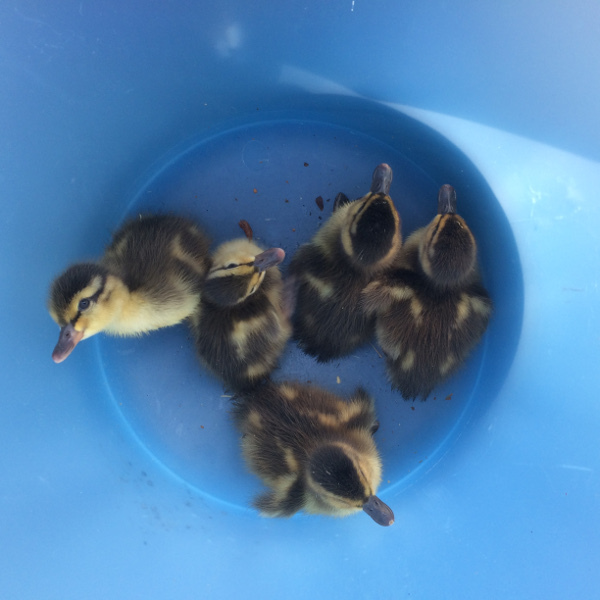 The mother went to the bucket and then escorted them all down the grass and into the pond. And then they swam away in a tight formation, all nine babies clinging closely behind the mother. Sydney said that it was the best day ever!